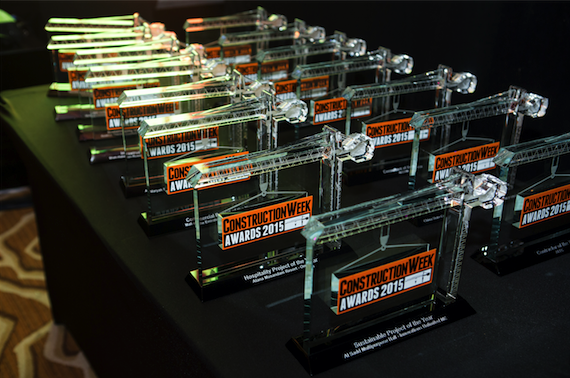 Innovations Unlimited ME (now known as powergreen) wins its first Construction Week Award at the Middle East event for 2015. Sustainable Project of the Year Award goes to Al Sadd Multipurpose Hall, the first sports arena in the world to have achieved a four-star GSAS certification. With its contemporary Photovoltaic system laid out over 1.8km2 of roof area and sized at 250KWp the installation has the potential to offset more than 150 tons of CO2 emissions every year. The environmental and social benefits of Al Sadd Multipurpose Hall are of high significance in a country that has just started to scratch the surface of its sustainability potential. Conceived as a role model venue for future clean stadium developments, Al Sadd Multipurpose Hall stands to be a landmark in Qatar in all upcoming sports events that precede the 2022 games. Before the Awards night concluded, Innovations Unlimited seized another trophy for a Highly Commended Title going to Project Manager Manos Kappas for his outstanding contributions to the slant of simultaneous renewable energy projects under the company’s portfolio.